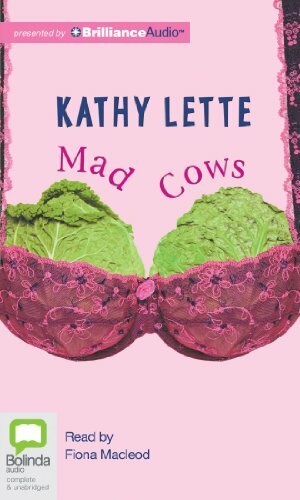 Kathy Lette is the bestselling author of seven novels, including Foetal Attraction, Mad Cows and - most recently - Nip 'n' Tuck. Mad Cows was also made into a motion picture starring Joanna Lumley and Anna Friel. Kathy lives in Hampstead, London, with her husband and two children. The irreverent author of Foetal Attraction returns with a raucous comic ode to the joys of motherhood, composed of equal parts male-bashing and bons mots. Framed by a thief in a London department store, Aussie Madeline Wolfe, a constipated, breast milk-sodden "mad cow" (single mother), is arrested with her one-month-old son, Jack, and sent to prison as an example of the British welfare state gone wrong. Guilty of nothing more than loving a womanizing louse, Maddy becomes embroiled in a series of misadventures that snowball from one outrageous incident to the next, from smuggling Jack out of jail in a handbag to a daring escape before a live TV audience, and stealing her son back from the clutches of an unscrupulous social worker. The victim of bad circumstances made worse by her own bad judgment, Maddy is a likable, if incessantly smart-mouthed woman with a fierce love for her offspring. She is also the only character who comes close to having "a full load of nappies" in a cast that includes Jack's father (a shallow, amoral TV star), Maddy's best friend (an oversexed upper-crust gold-digger with her own "Absolutely Fabulous" approach to motherhood) and a smattering of other half-baked (and half-witted) villains and heroes. Though the shock value of Lette's wisecracking wit is considerable (Maddy is "as culturally refined as a turd in a cocktail"), Lette's overindulgence in fresh talk becomes tiresome. But she gives new meaning to the phrase "mad cow disease" with this off-the-wall slice of maternal life that won't be found in any parenting book. $25,000 ad/promo; simultaneous Dove audio.